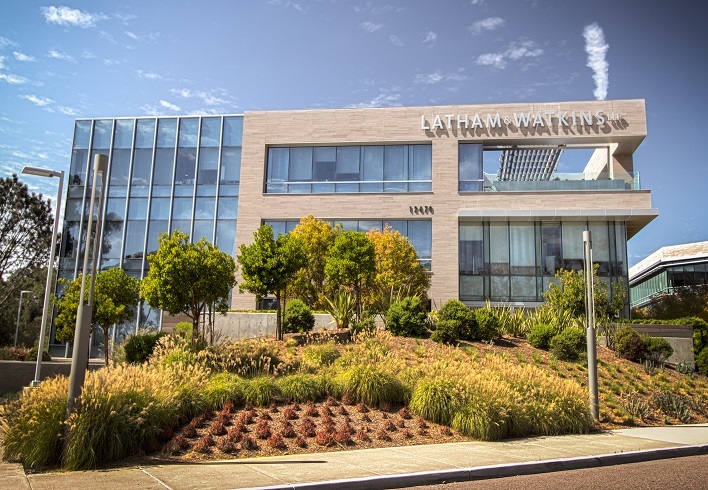 Latham & Watkins Tenant Improvement – McParlane & Associates Inc.
Latham & Watkins combined their Downtown San Diego facilities and Del Mar facilities into a new facility located at Del Mar Plaza One in Del Mar Heights, California. The project consisted of 69,000 sf of new tenant improvements along with the design and construction of a 3,500-sf patio on the ground floor and a 3,500-sf exterior deck on the third floor. The improvements included the following spaces: open and private offices, numerous conference rooms, catering areas (first and third floors), core restrooms, reception area, copy center, server room, IT areas, records filing area, training rooms, accounting, and other miscellaneous legal office amenities. The design and construction included complete tenant improvements on all three floors of the new shell building.